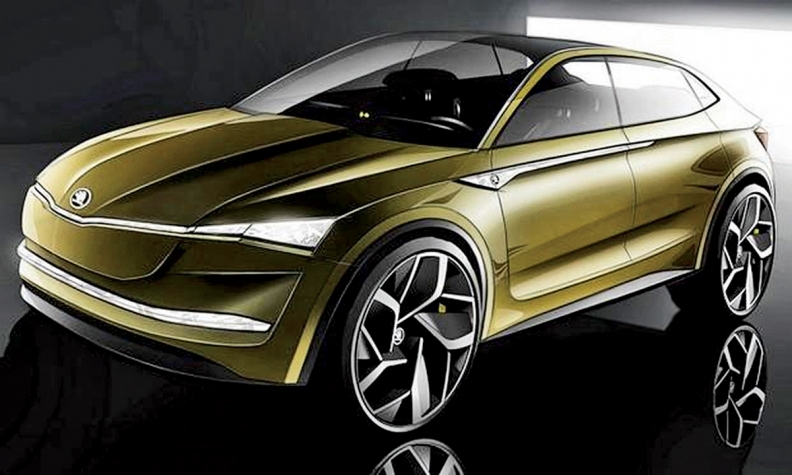 Skoda's Vision E previews a production model due in 2020. General Motors, Ford, Mercedes, Volkswagen Group and others all have plans to sell EVs and plug-in hybrids, and many will be on display at the Shanghai auto show next week. Foreign automakers have little choice. Last year, Beijing proposed carbon caps that would require automakers to earmark 8 percent of sales to EVs and plug-in hybrids. German automakers demanded a delay, but the plan -- which starts to take effect in 2018 -- seems likely to survive. Last year, EVs accounted for just 1.8 percent of China's industry sales, according to Reuters but the EV market is growing fast. In 2016, deliveries of EVs and plug-in hybrids in China jumped 50 percent to 507,000 vehicles, and the government expects sales this year will range from 700,000 to 800,000 vehicles. But there's a catch. According to industry analyst Michael Dunne, Chinese brands account for 97 percent of the country's total EV sales, and they are aggressively adding new models to defend market share. China's EV market "has four distinct features: Chinese-made vehicles, low price, limited range and dubious quality," said Dunne, who is president of Dunne Automotive, a Hong Kong-based consulting firm. Cheap EVs were profitable because government subsidies were generous. According to Reuters, the Chery eQ electric sedan could be purchased in Shanghai last year for $8,655 after subsidies. Without incentives, the car would have cost an extra $14,500. Sales of no-frills models such as the Chery eQ are expected to weaken as Beijing phases out subsidies, but foreign automakers aren't going after Chery's entry-level buyers. Instead, they will target consumers "who have relatively high disposable incomes, and who are looking for that next status symbol purchase," Shanghai-based IHS Markit analyst Namrita Chow says. GM plans to explore that upscale niche with the Buick Velite 5, a sedan based on the plug-in hybrid Chevrolet Volt. GM said last month that the Velite "will be launched shortly in China" and the production model is expected to be introduced at the Shanghai auto show. Other automakers will be showcasing new EVs, too. Ford will launch a plug-in hybrid in 2018 and a fully electric crossover in the next five years as it electrifies most of its China lineup by 2025. Volkswagen will introduce 15 EV and hybrid models over the next three or four years. The vehicles are expected to generate sales of 400,000 units annually by 2020. The Shanghai show "promises to be a fairground" for Chinese EV startups, Chow predicts. NIO, formerly known as NextEV, will display a self-driving electric car concept dubbed EVE, while the Hong Kong-based Hybrid Kinetic Group will showcase the H600 plug-in hybrid luxury sedan concept. These startups aspire to be the next Tesla, with models that capture the fancy of affluent technophiles. But it now appears that the Chinese version of Tesla will turn out to be Tesla itself. Last month, Chinese tech giant Tencent Holdings announced that it has acquired a 5 percent stake in Tesla for $1.78 billion. With Tencent's help, Tesla eventually could build an assembly plant in China and expand its modest presence there. But all these companies -- Tesla, Mercedes, GM and others -- are making an expensive bet on a segment that remains hypothetical. China's growing population of technophiles have money to spend. The question is whether they want to spend it on luxury EVs.